Some you see and some you don't. This is the time of year when some bird species can appear unexpectedly in gardens while others seem to disappear completely. Young birds have increased by large numbers, although only about a quarter will survive long enough to breed next spring. Many young leave the area in which they were hatched to find new and suitable habitat elsewhere, while both adults and young of migrant species start to head south for their wintering areas. So almost anything could turn up in The Farleighs. Your garden could be home to gangs of juvenile starlings foraging for leatherjackets (the larvae of daddy longlegs) on the lawn. The starlings may be noisy and unruly, but they are good for your lawn as the leatherjackets eat the grass roots and damage it. Meanwhile gatherings of sparrows could be enjoying communal dustbaths in your parched vegetable plots. Native thrushes and finches abound in the countryside, while migrant warblers and wheatears from the north pass through, and can be seen in local fields and hedgerows. As small birds migrate at night, migrants are often seen resting and feeding up in the early mornings. Meanwhile, most adults of resident species are silent and hiding themselves away as they go through their annual moult. Replacing flight feathers means their flying is less effective, so they keep a low profile to avoid predators. For a short period too it makes them look a total mess, with feathers missing and others looking totally ragged, until their new plumage is complete. 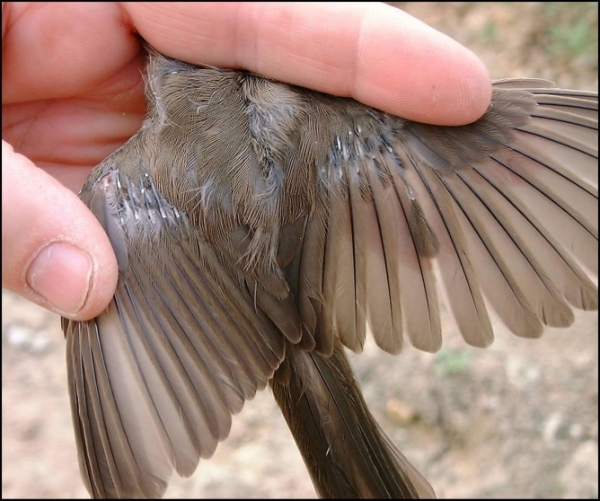 Feather replacement creates a huge energy demand so moulting birds exercise as little as possible to divert valuable food resources to feather production. feathers - you can see them emerging from the waxy shaft at their base. Keep an eye on your local speckly brown young robins and blackbirds as they gradually change from (the not so) ‘ugly ducklings’ into ‘swans’. And dull brown young starlings are slowly morphing into the iridescent, sparkling birds that mass in winter murmurations. While all this is going on, if you are lucky enough to have a tawny owl or a little owl breeding nearby, you may catch a glimpse of an immature youngster parked on a post to await its next feed. This is a good time of year to see owls because the young are often stationary and visible for long periods, while the adults are active in the early mornings and late afternoons hunting for, and supplying, additional food for them. Little owls are diurnal as well as nocturnal and it’s always a good idea to look out for them on fence posts, or atop old barns and farm buildings. Even in winter, they can be seen soaking up the warmth on a sunny day. Barn owls (the white ones) prefer to hunt around dawn and dusk and have regular circuits they fly around each day, so if you are lucky you may see them floating silently and butterfly-like along a grassy field margin or over tussocky grass. Another, less conspicuous, owl you may see - but most likely hear its brief "hoo-hoo" call - is the long-eared owl. The long 'ears' are actually for display purposes and aren't ears at all, but they add some 'aahhh' factor and make them look even more human. 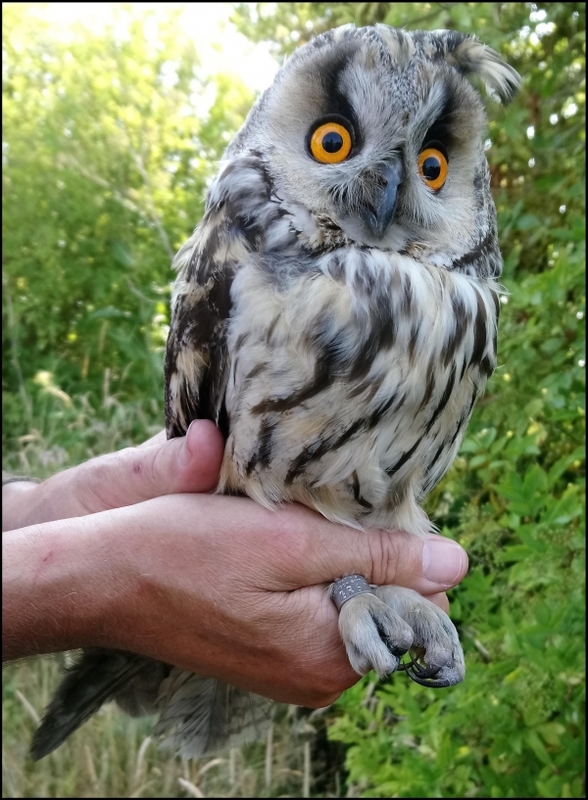 Their young are also out and about now, like this one ringed for conservation purposes at Conyer, near Sittingbourne, in July. A word of warning though: if you come across a young owl seemingly abandoned, it won’t be! Adults will know where it is and be visiting to feed it, so best to leave it be. This is especially the case if it happens to be a tawny owl chick, as the parents can be very protective and will attack an intruder. A pioneering, but unwary, bird photographer famously lost an eye at a tawny owl’s nest!